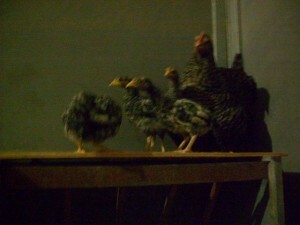 I was watching my hen, Madalyn(named this before I got her), mother her adopted chicks. She did not sit on the eggs but when the hen that did sit abandoned the chicks she watched them struggle for a few days then stepped in. I got to thinking how this compares to how I feel about people I sponsor in network marketing. I see so many great people who have not been properly “mothered” when it comes to business or financial matters. I did not have any financial training growing up but luckily people like Robert Kiyosaki who saw “un-mothered” people like me and wrote fantastic books to help us. Kiyosaki had already made a fortune so he did not have to write books but he did because he saw the need just like Madalyn, the hen, stepped up when she saw the need. It is interesting to watch how the chicks have taken to being mothered. When it gets dark at night they run for cover under Madalyn’s wings but during the day keeping them in line is another matter. The chicks think they have all the answers and insist on trying to escape the confines of the chicken yard. Inside the yard they are safe, outside they are not. It is that simple. My cat, Owl, jumped into the pen to harass the chicks and he quickly felt the wrath of Madalyn. Outside the pen he could easily have munched on the chicks. I do have a point here. I so want to coach and support my new business partners in my network marketing business and my company and business partners have created tools for us that are professional and effective. Yet, my new partners often insist on doing their own thing and this does not serve them at all.